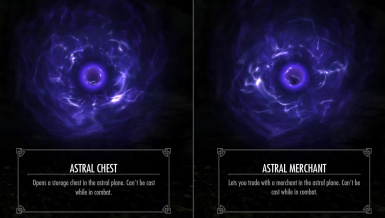 This mod adds two new spells, Astral Merchant and Astral Chest. Astral Merchant lets you trade with a merchant in the astral plane. Astral Chest opens a storage chest in the astral plane. 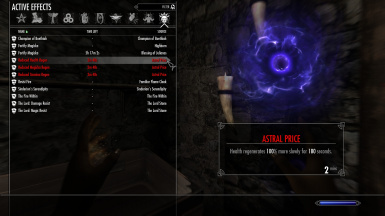 This mod adds two new spells, Astral Merchant and Astral Chest. They are lesser powers and cost no magicka, but they can not be cast during combat. 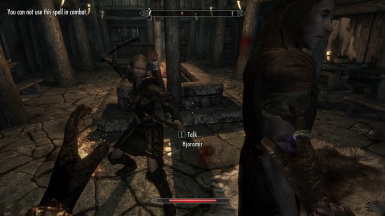 There are 2 versions of this mod: one has no cost attached to casting the spells, while the other severely impairs your magicka, stamina, and health regeneration for three minutes. Opens the barter menu with an astral merchant. This merchant is a general merchant and will buy anything that is not stolen. He has 750+ gold and a lot of useful supplies, and will restock at the same rate as normal merchants. Opens a chest in the astral plane that is safe for storage. Wonderful for geting all the loot out of a tomb. 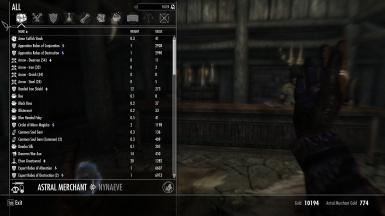 Both spell can be bought at Riverwood Trader in Riverwood, Bits and Pieces in Solitude and Niranye's stand in Windhelm. Use NMM. Or, if you're into that sort of thing, extract the files into your skyrim\data folder, open your mod manager of choise, and check AstralMerchantAndChest.esp. To switch from one version to the other, simply uninstall the old version and install the other. Any characters that already are using these spells will still have them, and the contents of the container and the merchant will not be affected by this procedure. Use NMM. Otherwise, delete AstralMerchantAndChest.esp from your skyrim\data folder, and the AstralChestScript, AstralMerchantScript, and/or AstralSpellScript files from the skyrim\data\script and skyrim\data\script\source folders. 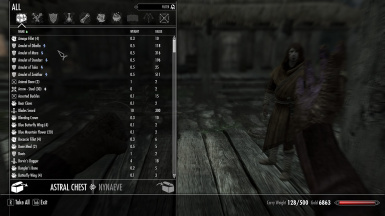 May conflict with any mod that changes the merchant containers of Riverwood Trader, Bits and Pieces or Niranye. Feel free to use this mod any way you like, as long as you give us credit.